In 1968 Gary Risse was so young that he has only vague memories of the day his father, Pete, brought a new three-quarter ton truck home. It was May 21, 1968. My dad bought it for $2,600 at the Hub Ford dealership on Peach Tree Road in Atlanta, GA., Risse has been told. Ford evidently did not want the truck to be misidentified so across the leading edge of the engine hood are large chrome letters spelling F O R D. A similar set of letters in white paint are spread across the tailgate. 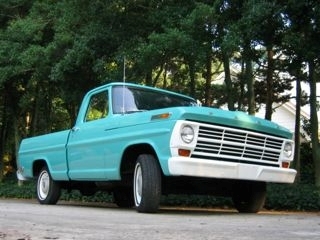 This truck was – and is – a classic bare bones work truck. “It has no frills, three on the tree, no air conditioner and manual everything,” Risse says. His father got what he wanted, basic transportation with no optional extras. 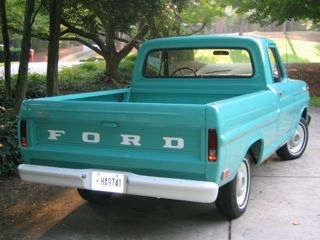 The light blue pickup has a wide grille and headlight surround painted white. Both bumpers are also painted white as are the wheels. Surprisingly there are two backup lights, probably because they are integrated into the taillight housing and were not extra. Because a cigarette lighter and an automatic choke were extra cost items neither one is found on the truck. Risse finds that he often has to explain the function of the manual choke to younger drivers. The very wide seat in the cab is equipped with two government mandated seat belts. The government also required in 1968 front and rear side marker lights. Risse recalls some of the most childhood fun that he and his sister, Terrie, had were on brief slow speed trips around their Georgia neighborhood riding in the six-foot bed of the truck. Another fond memory for Risse is when Saturdays were spent with his dad hauling stones home for later use in landscaping. He also learned how to drive on the truck. In order to protect the truck bed Risse's father constructed a wooden bed liner. In addition to receiving careful cosmetic attention, the 4,200-pound truck also was carefully maintained mechanically and was never abused. The 240-cubic-inch, in-line six-cylinder engine regularly had the five-quarts of oil changed. According to Risse the truck never was pressed into towing anything which undoubtedly boosted the longevity of the clutch and transmission. “It still runs like a top,” Risse reports. With the exception of the upholstered bench seat, Risse says the interior of the cab is mostly steel or rubber. You can just hose it out if it gets dirty, he says. It was about 10 years ago that Risse assumed ownership of the truck that seemingly had always been a part of the family. He replaced a lot of the rubber parts and then, he says, I had it repainted in the original color. Since the truck has always received excellent care and was garaged most of the time there was virtually no body work involved. The odometer on the old Ford has currently recorded 112,000 miles and the pickup shows no signs of aging.